A full round of midweek games gives us the perfect chance to make up for the frustrations of the weekend just gone. As usual we will be looking at the first goalscorer and anytime goalscorer markets and using the Inside FPL stats to uncover some under the radar players who may provide some big priced value. I also want to introduce a new type of bet in player goal minutes. The numbers from Gameweek 13 see several of the usual FPL suspects top the expected goals chart. Nestled in amongst Aguero, Rooney and Giroud however is a new name in that of Gerard Deulofeu. 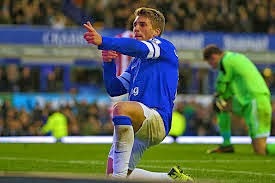 The diminutive Spaniard marked his first Premier League start with a total of 5 shots, 4 on target and 3 from zones A/B. If we also look at the season to date stats we can see Deulofeu is now racing up the list of expected goals by Everton players despite only having played 247 minutes in the league. Deulofeu loves to run with the ball at his feet and already looks like an ideal foil for target man Romelu Lukaku. Everton will fancy his chances of causing problems for a Manchester United defence that has sometimes struggled against similar tricky opponents this season (Amalfatino and Arnautovic spring to mind) and we fancy his chances to open the scoring at 16/1 (Bet365). The two defenders with the highest expected goals continue to be Chelsea duo Branislav Ivanovic and John Terry. Chelsea really share out the goals and have had a remarkable fifteen different goalscorers so far this season. This midweek they face a Sunderland side who, although not the worst, are still near to the top of the tables for both corners conceded and headed attempts conceded. Both Terry and Ivanovic have scored against the Black Cats in recent seasons and we can’t split them so will bet half stakes on each to score first at the same price of 25/1 (BetFred, Totesport, Coral, PaddyPower). In Gameweek 12 we mentioned that Aston Villa were conceding the most headed goal attempts in the league, although West Brom were unable to make the most of this on that occasion. On Wednesday Southampton will try their luck and look to take advantage of the set piece delivery of young midfielder James Ward-Prowse. The players hoping to get on the end of these crosses will likely be centre backs Dejan Lovren and Jose Fonte. The season ratings show both defenders have offered a similar goal threat this season but at a more favourable price we will plump for a BUY of Lovren player goal minutes at 4 (Spreadex). What is Player Goal Minutes? An interesting alternative to the first goalscorer market, player goal minutes is a spread bet where your job is to predict the minute(s) in which your chosen player will score. Rather than a straight win or loss, the result of the bet is the aggregate of the minutes in which your player scores. For example, if your player scores twice, in the 54th and 73rd minutes, the result is 127. If your player doesn’t score the result is 0. By placing a BUY bet you are betting that your player’s total will be higher than the price quoted. The more goals our player scores, and the later in the game he scores them, the more we stand to win. Spread Betting has a reputation for being risky and it is true that some spread markets can be very volatile. My advice to beginners would be stick to markets where you can easily calculate the most money you can lose on your bet before you place it. In the example above, if you bet £1 then the total risk is £1 PER MINUTE. If the player does not score the result is 0 and you lose £1 x 4 minutes = £4. That’s all, as before if anyone has any questions about any games I haven’t mentioned feel free to ask. Good luck! Everton left-back Leighton Baines has been ruled out for between 10 days and six weeks after fracturing a toe against Liverpool last Saturday.